Look up at the sky on any sunny day and you are likely to see far-off trails of what looks like white smoke streaking across the sky. These are particularly common in areas wherein jet planes routinely fly over, and some of them are indeed contrails emitting from these craft. Chemtrails on the other hand, are a bit harder to explain, and some people have even ascribed sinister meanings to them. This article covers the differences between each, as well as the theories behind their formation and purpose. A contrail is the white plume of what looks like smoke trailing a jet plane in flight. They typically form at altitudes of 33,000 feet and higher, when the cold air in the upper atmosphere reacts with the hot engine of a jet. Chemtrails are a lot like contrails, and many people in fact either confuse them with one another, or simply feel that they are one and the same thing. Chemtrails may take on a wider and more pattern-like shape, and they may even form larger cloud masses. 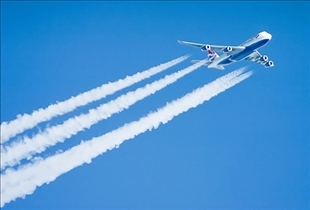 Contrails are formed when the water in the cold air condenses when it comes in contact with the hot engine of a jet. This causes the characteristic white streak that traces the path of a jet that has flown overhead. The length of time that the contrail stays visible is dependent on the wind and weather conditions. Given favorable conditions, contrails can stay in the air for several minutes and even hours. Chemtrails on the other hand, are thought by many to be formed with the spraying of chemicals such as aluminum into the atmosphere. These white plumes are usually wider than a typical contrail, and may spread out to form patterns or they may even form larger cloud-like masses. Like contrails, chemtrails can also stay in the sky for hours. Contrails can of course be explained easily enough with scientific explanations, but chemtrails on the other hand have some mystery about them. More than a few people have put forth the idea that chemtrails are actually the result of intentional spraying into the air of chemicals or other substances. As for the purpose of this spraying, proponents believe that it is done for population control, biowarfare, or weather control, and possibly as a way to "fill-in" the hole in the ozone layer. 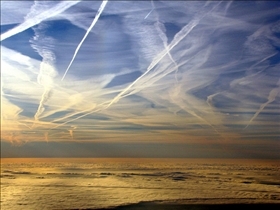 Various organizations, including the government, have been blamed for the existence of chemtrails, and many believe that they are sprayed into the atmosphere for some secret purpose. Nevertheless, no agency–government or otherwise–has admitted to any involvement in the covert use of chemtrails. Which one do you see in the sky more often?